Modern cooks are rediscovering the wide world of leafy greens. But how do you buy, store and prepare these nutritious, delicious superfoods? 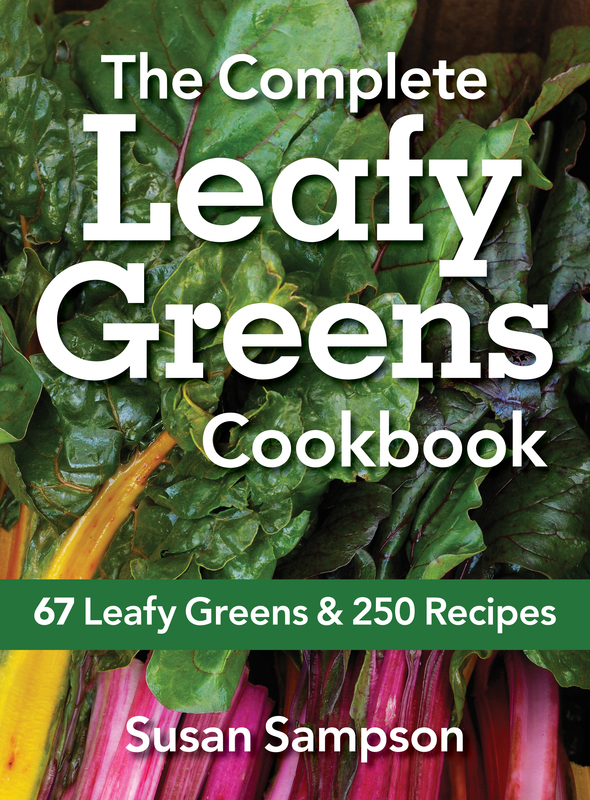 Covering everything from spinach to bok choy to nettles, The Complete Leafy Greens Cookbook will help you embrace the unfamiliar as well as offering a fresh outlook on old favorites. Carrot greens are bitter, herbaceous and astringent, with a hint of sweetness in the finish. They are coarse and grainy when raw. The stems taste like celery but are too stringy to use. Although no official government analysis is available, carrot tops probably have a nutritional profile similar to their roots. This would suggest that carrot tops provide vitamins A, B6, C and K, folate, manganese, niacin, potassium and thiamin. This Moroccan-style dish tastes good, looks good and is good for you. Enjoy it warm or at room temperature. Carrot greens are used in place of herbs instead of going to waste. 1. On a large cutting board, combine carrot leaves with lemon juice and salt. Using a sharp knife, chop them finely. Transfer greens and juices to a serving bowl. Stir in garlic and pepper. Set aside. 2. In a saucepan over medium-high heat, bring stock to a boil. Add couscous in a steady stream, stirring constantly. When mixture returns to a simmer, cover and remove from heat. Set aside for about 5 minutes, until liquid is completely absorbed. 3. Add couscous to carrot leaves and mix with a fork. Let stand for 5 minutes, until slightly cooled. Add oil, carrots, currants and pistachios and mix gently with a fork. Scatter mint overtop. Serve warm or at room temperature. The raw leaves are soft and delicate. They taste herbaceous, slightly spinachy and astringent. The flowers and stems are nutty, with a slightly bitter finish. When cooked, chickweed leaves are milder and taste faintly like spinach, with a nutty finish and hints of tea. Although no official government analysis is available, chickweed is thought to contain vitamin C, calcium, iron, magnesium, niacin, potassium, riboflavin, thiamin and zinc. Don't say the word weed when serving this genteel salad. Delicate chickweed tossed with pecans and dried cherries makes a starter worth serving to guests. However, you needn't save it for special occasions. 1. In a bowl, toss chickweed with vinaigrette to taste (you will have some left over). Add pecans and dried cherries and toss lightly to combine. Serve immediately. Tangerine juice gives this dressing its sunny disposition. 1. In a bowl, whisk together tangerine juice, mustard, sugar, salt and pepper. Gradually whisk in oil. Transfer to an airtight container and refrigerate for up to 2 weeks. Houttuynia is an acquired taste, with common reactions ranging from dislike to disgust. The leaves are tender and demure, but don't be fooled -- the flavor and aroma give taste buds a one-two punch. This green lives up to the name "fishwort." It has a raw fish flavor, more than hints of briny sea, and is extremely metallic. The Chinese/Vietnamese variety is differentiated by its citrus accents, while the Japanese variety has cilantro accents. No official government analysis is available, but houttunyia is thought to contain vitamins A and C, copper, manganese and phosphorus. It is relatively high in fiber. Houttuynia has been the subject of several scientific studies and is ranked high in herbal medicine. It is considered a diuretic and a laxative and is used to produce an antimicrobial extract. This twist on a classic Vietnamese dish is appealing, despite the impossible-to-ignore metallic tang of the houttuynia. I wouldn't fault you if you decided to replace it with a more palatable tender green, such as baby spinach, watercress or mizuna. 1. Tofu: In a shallow dish just big enough to hold them, arrange tofu slices close together in a single layer. Set aside. 2. In a measuring cup, combine lemon juice, oil, garlic, lemongrass, sugar and salt. Pour over tofu, shaking dish to evenly distribute marinade. Cover and refrigerate for 1 hour. 3. Place grilling tray on grate and preheat barbecue to medium. Arrange tofu on tray, letting excess marinade run back into dish; reserve marinade. Cover and grill for 3 to 5 minutes per side, until golden brown with grill marks. Set aside. 4. Pour reserved marinade through a fine-mesh sieve set over a small saucepan, discarding solids. Bring to a full boil over medium-high heat, then set aside. 5. Noodles: In a large saucepan of boiling salted water, cook noodles over medium heat for 4 to 5 minutes, until tender but firm. Drain and rinse with cold water. Drain well and transfer to a large bowl. Pour boiled marinade over noodles. Add houttuynia and mint. Toss gently and season with salt to taste. 6. Divide noodles among serving bowls. Scatter peanuts overtop. Arrange grilled tofu and cucumber on top. Scatter shallots over tofu. Serve immediately or at room temperature. Fresh leaves are described as bitter. Thawed frozen jute tastes spinachy and grassy but mild. It is mucilaginous (similar to Malabar spinach) and has an extremely slippery texture. It is disparaged as "slimy" by those who don't like it. Jute leaf contains vitamins A, B6 and C, calcium, copper, folate, iron, manganese, magnesium, niacin, potassium, thiamin and zinc. Jute contains mucilage, considered a detoxifying agent as well as a rich source of soluble fiber. Some historians say Cleopatra consumed it as part of her beauty and anti-wrinkle regimen. Egyptians say that if you haven't tried molokhia, you haven't really been to Egypt. It is considered Egypt's national soup and is also popular in Jordan, Syria, Lebanon and Tunisia. How it is cooked and presented varies a great deal from family to family, but molokhia is always spiced and garlicky. Serve this vegetarian version with toasted pitas or a bowl of hot rice -- the soup may be spooned over the rice or the rice added to the soup. 1. Tomato Drizzle: In a small bowl, combine hot water, tomato paste, oil, garlic, hot pepper sauce, salt and pepper to taste. Set aside. 2. Soup: In a saucepan over medium heat, bring jute leaf and stock to a simmer, stirring occasionally (do not allow it to boil). 3. Meanwhile, in a small saucepan over medium-low heat, combine oil, garlic, coriander, cardamom and salt. Cook, stirring often, for 2 to 3 minutes, until golden (do not allow garlic to brown). Stir into simmering soup. Remove from heat and stir in lemon juice. 4. Ladle into individual bowls and top with tomato drizzle. Serve immediately. Komatsuna has a mild but distinct mustard flavor. It is slightly sharp, slightly sour, yet slightly sweet. The stems are succulent. Komatsuna contains vitamins A, B6 and C, calcium, copper, folate, iron, manganese, niacin, potassium, riboflavin and thiamin. It is particularly high in fiber. This dish, with buckwheat noodles, komatsuna and mushrooms in a dark, rich broth, is typical of Japanese soups -- wholesome and full of the savory deliciousness known as umami. Although technically a soup, it's really a meal in itself. Eat the noodles and vegetables with chopsticks, then drink the broth. 1. In a large pan of boiling salted water, cook noodles over medium heat for 7 to 8 minutes, until tender but firm. Drain. 2. Meanwhile, in a saucepan, whisk together miso and 1 cup stock, until combined. Add remaining stock, water, mirin and soy sauce. Place over medium-high heat and bring to a simmer. Add komatsuna to taste and mushrooms; cover, reduce heat to medium-low and simmer for about 5 minutes, until greens are tender-crisp. Add tofu, cover and heat for about 1 minute, until warmed through. 3. Divide prepared noodles evenly among six large, shallow serving bowls. Using a slotted spoon, scoop out komatsuna, mushroom and tofu mixture and place in bowls. Ladle equal quantities of broth over noodles. Scatter green onions overtop. Sprinkle with togarashi to taste, and serve warm. Excerpted from The Complete Leafy Greens Cookbook by Susan Sampson © 2013 Robert Rose Inc. www.robertrose.ca Reprinted with publisher permission. Susan Sampson is a food writer, recipe developer and blogger, and the author of 12,167 Kitchen and Cooking Secrets and 200 Best Canned Fish and Seafood Recipes. She shares recipes and kitchen secrets on her website, The Fare Lady.